Discussion in 'Projects & Mods' started by mwong168, Dec 5, 2012. This is not my design or idea and I sent to original poster a quick message for permission to share on here and he had no problem as long as he was given credit. Thanks goes out pinballmike217 for giving me permission to sharing all this with you guys. 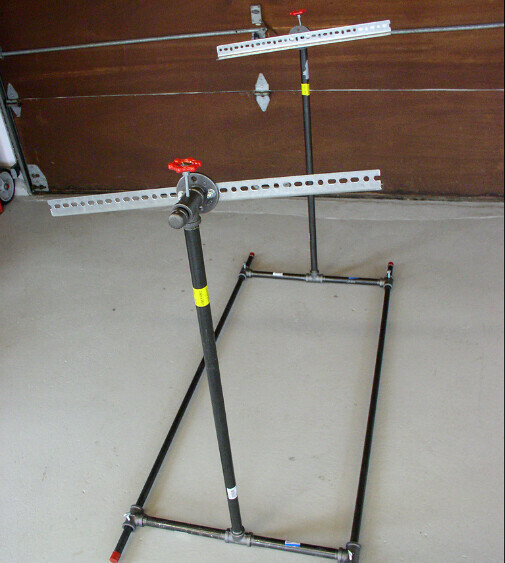 I actually came across this "homebrew" playfield rotisserie a few years ago when he made his first black pipe version and seems he has updated it with some new improvements over the previous version which has been around for apparently 6 years on RGP. The new design uses a single 3/4" upright instead of boxed 1/2" uprights and is just as strong but uses way less parts. It an hour and ten minutes to build without rushing and total cost was $97.00 at Home Depot. 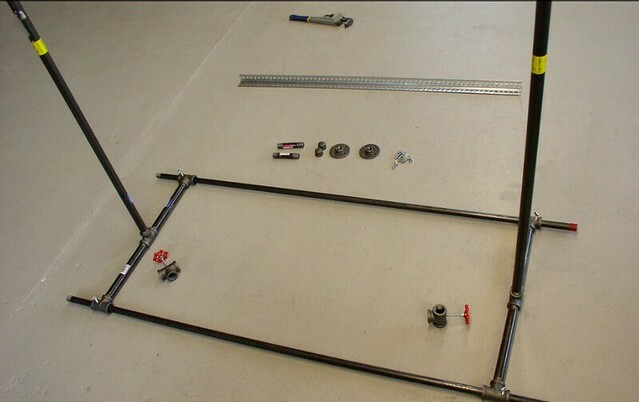 Disclaimer: There is a 1/2" of side/side movement with a playfield mounted. If you can't live with that don't build this. 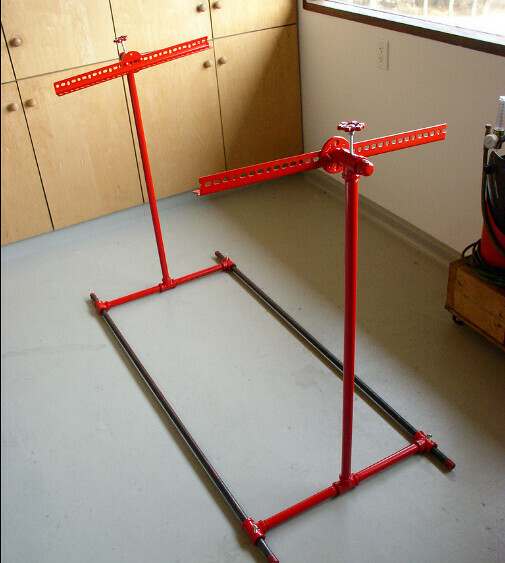 You can make a sawhorse or tabletop version of the hub and axle assembly for about $50 which will be 100% rigid. 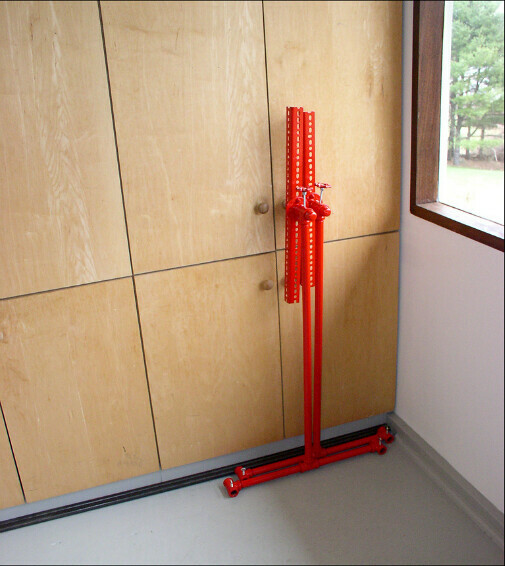 I like this floorstanding design because it knocks down in less than a minute and takes up virtually no space. #7 or 13/64 drill bit. 1. Four T's need to be drilled and tapped as shown for the feet. T's must be drilled laying flat. 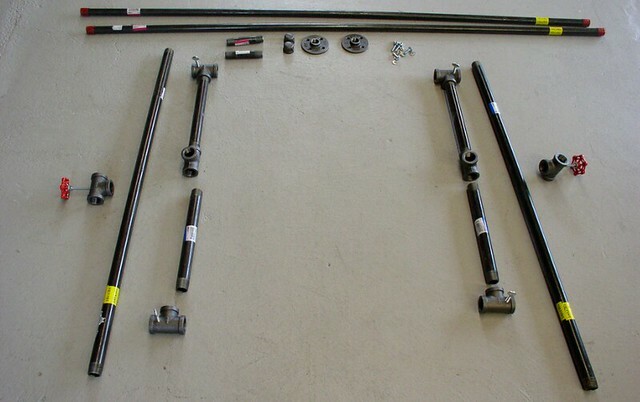 Two T's must be drilled and tapped for the axle assembly. These must be drilled from the top. 2. 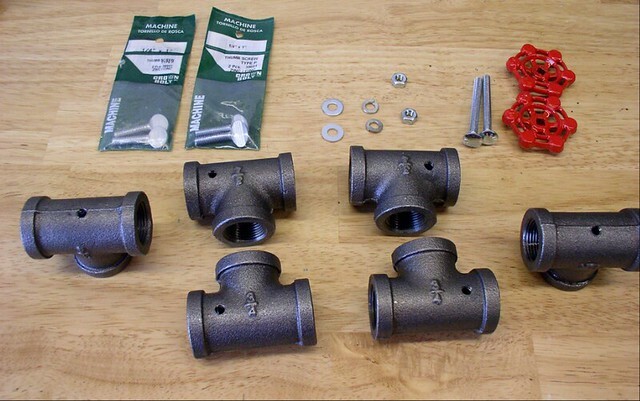 Assemble the faucet handles with the two long carriage bolts, washers, and nuts as shown and thread into T's. Thread the four thumbscrews and the four T's that will be used as feet. 3. Lay out stock as shown. Thread the four 10" pipes into the four feet. Connect each pair into another "T" in the center. Make sure the feet are flat on the floor and the center "T" is pointing straight up. 4. Thread the two 36" uprights into the center "T". 5. Run the two 60" crossbeam pipes through the feet "T"s.
6. Thread the axle "T" onto the upright, parallel to the crossbeams. 7. 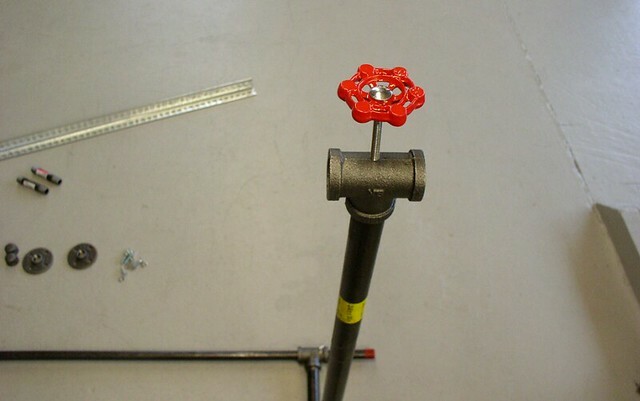 Insert the 4" pipe through the axle "T" and install a cap on the otside and a flange on the inside. 8. 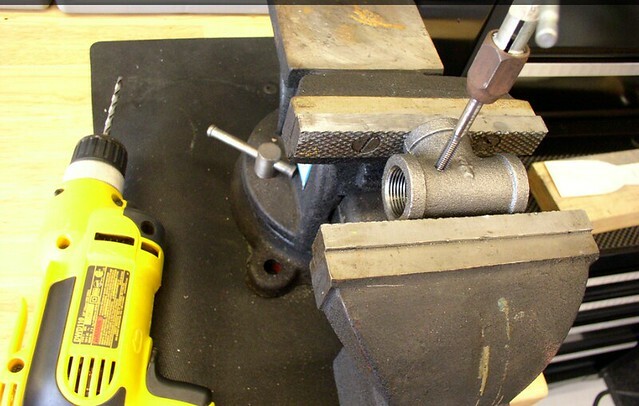 Cut the 48" perforated angle iron in half and secure each half to a flange with two 1" carriage bolts, washers, and nuts. 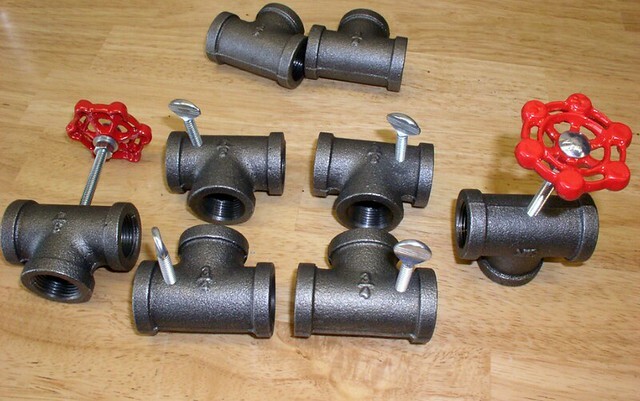 Make sure you tighten all the black pipe super tight when assembling. Also, give the thumbscrews in the feet a good crank with a wrench once the crossbeams are positioned so they won't come loose. 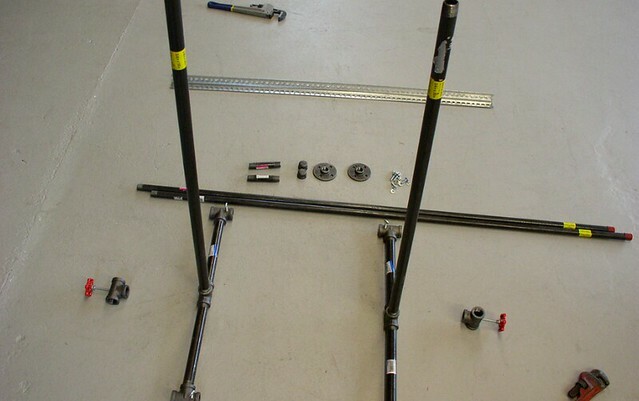 If you want to do a tabletop or sawhorse version, the axle assemblies stay the same. 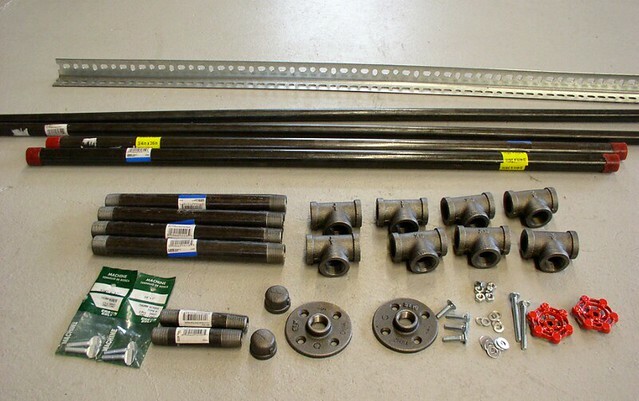 Just substitute everything below the axle "T" with a 3/4" X 12" black pipe and a 3/4" flange. 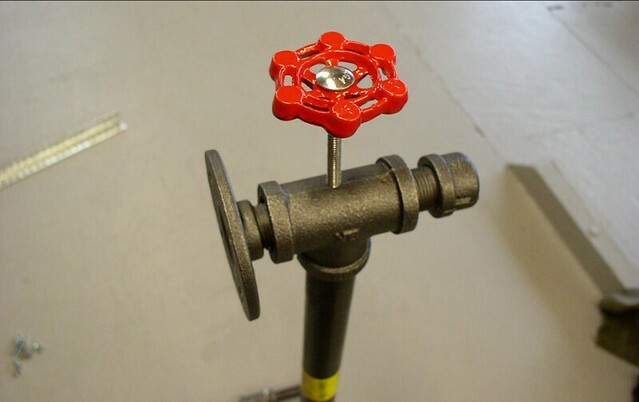 Screw the flange onto the top of your table or sawhorse and get to work. These pics also shows you how little space it takes when broken down and not in use only to be reassembled again in minutes. I will be building one of these in a few weeks or towards the end of winter for my WH20 shop/restore and I500 pf swap. Thanks for posting this! Its one of the things that will be on my list to build for all my upcoming projects. I would personally suggest if you are going to go this route, invest in a proper Rotisserie. I built one of these home made ones and they are no where near as secure or as easy to use as the properly built ones. Being lazy, where would I buy a "proper Rotisserie"?? Going to a pinball show is probably your best bet. Shipping on these would be killer. Although a certain store *cough*pinballcustoms.com*cough* might be selling kits someday. Are all the playfields of all manufacturers of all era the same lenght? 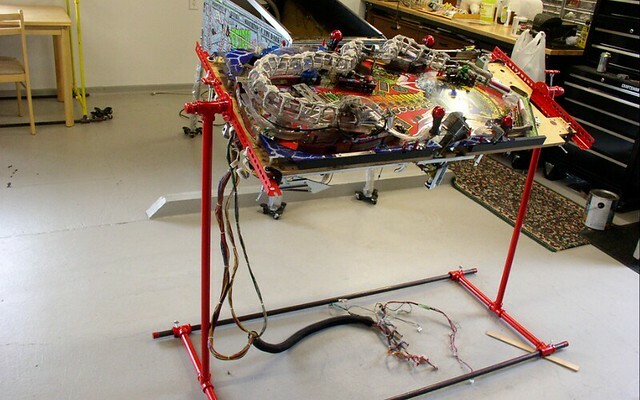 Do all playfield have clearance top and bottom to rest unobstucted on the angle iron or do you sometimes have to remove stuff underneath the playfield so it can rest flat? 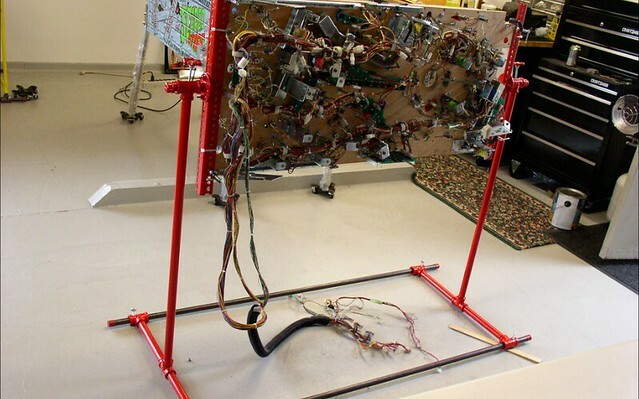 They are not all the same length but that doesn't matter as a ready made one can be adjusted to length the fit as you can see here and should have to remove stuff under the playfield as it was designed so you have easy access to both top and bottom. Shipping will be killer on this but if you are going to Allentown then perhaps you can grab it or a friend who is driving there and back with the space could. This is the unit I purchased. It's great but, as Mike mentioned, it's costly to ship. I may do exactly as Mike suggests and see if I can pick up a second one at a show like Allentown. As much as I'd like to build one... I just don't have the time. Thanks Gents. Build us and sell us a kit Brock. This is what I need! Its impossible to solder POTO at a 90* angle! Now I just need to figure out where I could possibly store it! Lowes had all of the items in stock but after I tallied up the price of all the materials it was going to cost nearly $200 before taxes. 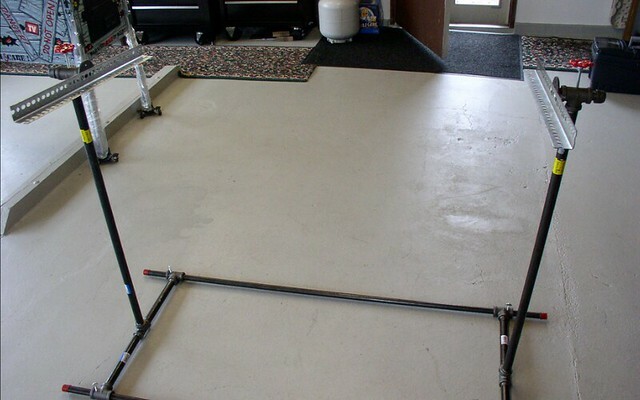 There is a more professional looking (and more sturdy) one selling on eBay for $220US+$38 shipping within the US. Even with exchange, I think this would be the way to go. If I can find a decent one in Allentown when in there this year, I'll probably pick it up. I'm sure I could knock a few bucks off building it myself if I made a trip to the US Home Depot or Lowes, however it would still be a homebrew rotisserie. I bought a professional one from a guy in MN, and it's been decent. Seen a lot of swaps so far, but my only complaint is the locking mech as it's micky mouse. The unit Monkeybug bought is great, and if I ever need to replace mine that would be the one I go after. Last year Drano and I checked these rotisseries were going for $400-500 on ebay but looks like they are cheaper now. Surprisingly yes! Just don't ask me which ones though... I do know Black Hole was one that went on the 'tisserie! I bought mine a while back (same as the BAA version) from that same seller on eBay for around $200. Then, went to go buy a 2nd one a year later and he had jacked up his pricing to $400+. I've been wanting another tabletop version so, just for fun, I checked again a couple of weeks ago and that very same seller has now dropped his price back to about $220. I already have #2 on the way and, while the locking mech is not overly industrial, there are two of them (one at either end) an I have never had anything slip. I also have a standup "pipe" rotisserie, but have yet to really put it through its paces. The only thing available in allentown last year was a massive structure that resembled a rolling clothes rack. It had lots of arms and clamps for tools and lights and such... but I like being able to break down my table top unit and slide it under just about anything. It's super compact, sturdy and professional. Looks like that $220 version is the way to go if Allentown isn't going to have any.